Except for those who can control it…Worst. Birthday. Ever. Another bell rang. I spun wildly, searching for the source, and my foot slipped out from under me. My left foot joined my right, sliding down a rocky surface. A scream tore past my lips. My brain fought to figure out what was happening as my hands gripped for something—anything—because I was falling. My head swiveled. I couldn’t comprehend the giant, gaping crack I’d fallen into. A fissure in the ground at least eight feet wide. My fingers sunk into the cracked concrete, barely holding on. Sliding. No end in sight. An abyss. Everything around me blurred, and all I could see was black. And in that blackness was the one thing I was terrified of: death. My stomach pitched and my chest heaved, but no air moved in or out of my lungs. I was suffocating. Ripping my eyes away from the darkness, I focused on my hands, still grasping at the gravely terrain crumbling beneath them. My right foot slipped, and my fingers dug deeper into the ground. It was a mixture of rock, and mud, and I didn’t know what. It felt like glass shards were being shoved under my fingernails. I dug in with my toes, using the muscles in my legs to slow my descent. I slid to a halt, but the rocks and substrate continued to crumble beneath me. I searched blindly for a sturdy foothold. My foot found a rocky lip, but as soon as I thought it was safe, it gave way. My right silver flip-flop plummeted into the darkness so eager to swallow me. Attempting to force my gaze upward, I focused on the contrast of the dark surrounding me and the bright light above, the line where they met. Technically, I’d die in broad daylight. Reid. Reid was here. That’s where I was. I was at Reid’s place. I’d come here to train. I’m an Oculi. It all became clear as I broke free from the terror. Dragging in an uneven breath, looking into his clear eyes, something clicked in the far reaches of my mind. I Pushed with no effort. No headache, no nausea. I blinked, and stairs carved themselves into the side of the chasm, jutted out as if they’d always been there. With great hesitancy, I climbed the stairs on all fours, close to the wall. I could see the surface, right within my reach. I felt myself tumbling, falling. Flailing along the wall of the abyss with nothing to stop my descent. I focused on the surface, on the light growing dimmer the farther I skidded. Earth. Ground beneath my feet. I Pushed. And Pushed. Thunder sounded below, like the darkness of the chasm was rising up to swallow me whole. Something hit my feet so hard that it tossed me in the air. Up. Up. Into the light. My thoughts didn’t coalesce clearly, but I felt myself rising. The pain behind my eyes made my vision waver. I shot to the warehouse floor. Reid reached for me as I collapsed. My lungs rebelled, and tears burned trails down my cheeks. Dirt covered my hands and caked beneath my fingertips. One fingernail had broken to the quick. It bled sullenly. I wasn’t about to look weak in front of him, though, so I held out my arm to ward off his offer of help. I stood tall on trembling legs. The light streaming through the warehouse windows dimmed and flickered. Darkness edged my periphery. I balled my trembling fist and slammed my knuckles into his cheek. White heat shot through my hand before everything went black. 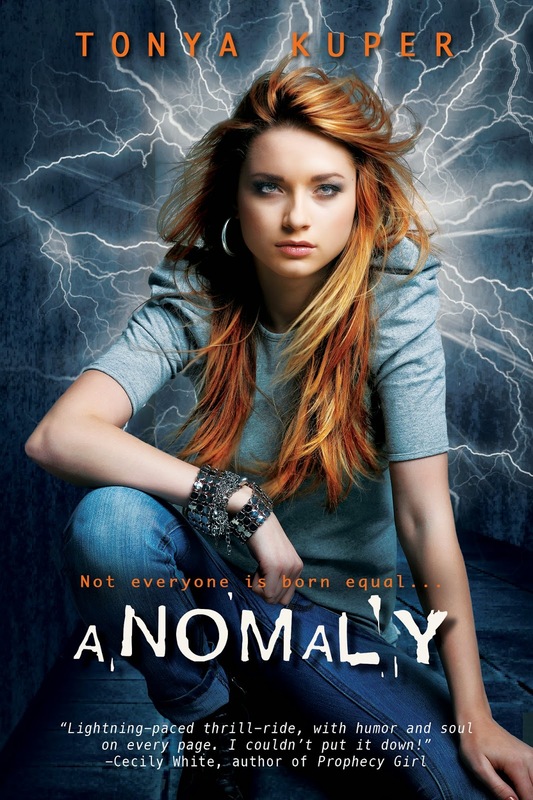 Tonya Kuper’s debut, ANOMALY, the first in the Schrodinger’s Consortium young adult scifi trilogy, releases November 2014 by Entangled Teen. 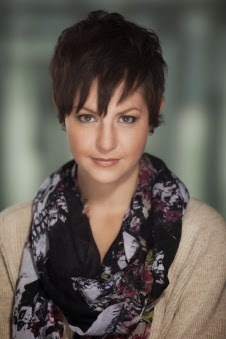 She lives in Omaha, NE with her two rad boys and husband, is a music junkie, and a chocolate addict. Star Wars & Sherlock fan.